A new research report has uncovered some great news for people who love making sure women have tons of abortions: make it illegal. And, while you're at it, if you go ahead and limit women's access to contraception, they'll end up pregnant and desperate enough to resort to unsafe measures more often, resulting in more unsafe procedures and more death. It'll be a Santorumtopia! Personhood paradise! Culture of life! Abortion rates were lowest in Western Europe - 12 per 1,000 - and highest in Eastern Europe - 43 per 1,000. The rate in North America was 19 per 1,000. Sedgh said she and colleagues found a link between higher abortion rates and regions with more restrictive legislation, such as in Latin America and Africa. They also found that 95 to 97 percent of abortions in those regions were unsafe. Say it ain't so. The evil, godless, socialists with their low birth rates and secular public spaces, the European nightmare, actually produces fewer abortions than all those countries that are doing what God/The Pope want by limiting women's contraceptive options? And making abortions illegal isn't actually saving any babies at all? What, exactly, do abortion-restricting laws do for women? Well, abortion restrictions certainly help injure women. The researchers' report estimates that 47,000 women die of abortion-related complications per year, and another 8.5 million experience non-fatal but serious complications. If abortions are so unsafe, then why don't these silly, desperate women realize that the the state knows what's best for them and have the babies? Turns out, pregnancy and childbirth are much riskier than abortion. The United Nations Population Fund estimates that 536,000 women die during childbirth per year, leaving about 1 million children motherless. Fifteen million women suffer from childbirth-related complications that result in "severe or long-lasting illnesses or disabilities." The safest unwanted pregnancy is not being pregnant at all. And that requires widespread availability of safe, low-cost contraceptives. But of course, this will likely fall on deaf ears, and conservative lawmakers stateside will continue to beat the drum of limiting reproductive rights in the name of "saving babies" or knowing what's best for women. What they don't seem to realize (and what this report implies) is that an unwanted pregnancy can be horrible and terrifying and a desperate woman who wants to be unpregnant will seek abortion regardless of its legality, regardless of its safety. 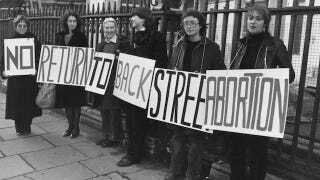 One more time, with feeling: making abortions illegal doesn't save anyone; it just hurts women.